Earlier this year, I set a goal for myself to be able to go to the gym 3 times a week. This was difficult during the time when I had Spanish classes twice a week, but I'm free for the Summer now so I have been working hard on getting my body toned. I have finally achieved my goal, and I'm maintaining this pace. Sometimes, I get demotivated to go to the gym. Honestly, getting there is the hardest part because once I am there, I power through every workout. I've noticed that when I fall off the fitness wagon, something that really helps me get back into it is new gymwear. Considering that gymwear isn't always cheap, I thought I'd put together a list of stores which stock affordable fitness clothing. As a challenge, I have put a €15 limit on the items and quite a few stores made the cut. Decathlon is an amazing brand if you are looking for any sports or fitness related products. 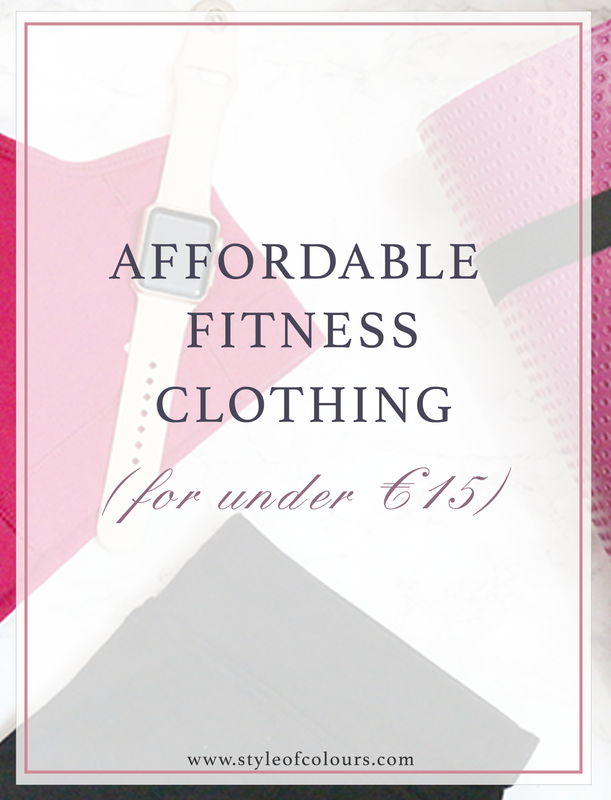 They also have their own range of gymwear which is very affordable, and with the discounts they usually have you can get a sports bra for as low as €3. I already own a couple of these and the quality is really good. Lefties which is the sister brand of Zara is known for affordable clothing and footwear, and they also have a fitness range. The collection includes sports bras, leggings, footwear and more. There aren't a lot of designs to choose from, but the prices are great. I really hope they expand this range because the clothing fits well and is comfortable which is exactly what you need at the gym. Obviously this post will not be complete without including Primark. Their fitness range is cute and affordable, meaning you can build your fitness wardrobe guilt free. I am always lusting after the gym wear in Primark, but somehow it is never available in my size when I go. Sports Direct is great for ordering fitness clothing online. The prices are low and the discounts are even better. There are so many different items of different styles, you'll be sure to find something you like. The only difficulty you will face is being able to try them on. But they sizes are pretty standard so that should make picking out clothing that will fit you easy, plus they have got a clear return address and policy valid 14 days after the receipt of the order. Another store that is great for gym clothing is Newlook. I think I was living under a rock and just never paid attention to their sportswear range, but after looking at it I honestly want all of it. The prices are below €15 as is, and if you check their sale section, they have some amazing pieces for as low as €5. Honestly, I think I am off to place an order once I hit publish on this post. Now if you prefer to pick a more popular sports brand, but do not want to spend around € 30 on a gym vest, then I would recommend checking out Get The Label. The prices for fitness clothing from Adidas, Nike or Puma start at about €10, but you can also find some for lower. What other stores have a fitness range with items under €15?